wow, I'm impressed you have that kind of room to play with. What does the steering rack setup in the quantum look like? the german wrote: wow, I'm impressed you have that kind of room to play with. 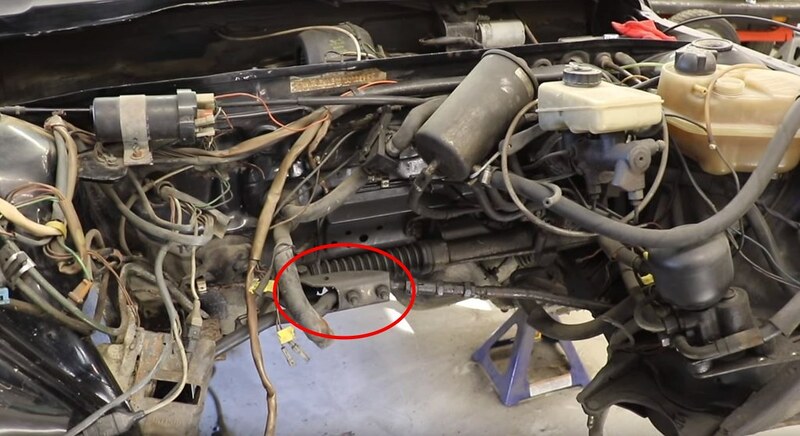 What does the steering rack setup in the quantum look like? It's similar to a 4000. I'd bet identical. it's been a real long time since I've looked, but I'll have to see. I know there will be fitment issues somewhere along the line once I try to do this. I'm just going to have to work around it, but I know it's doable. So I checked out the steering rack situation on the quantum last night to see how far I could shove the engine back without having to modify the steering rack's location and the answer is not as much as I want. It looks to me that there is maybe 1" - 1.5" max before I'll run into issues with the bell housing touching the rack. So I'll start figuring a solution that I can attempt to implement in the future. yeah that is what I was thinking would be the case. From a weight distribution perspective it's not generally worth the effort unless you can get things back 4-6", but if you need the space up front to fit a radiator that 1.5" may be pretty valuable. Bang, instant 3" clearance gained. That's a possibility, but I'm not sure where the clutch will be either. It may not be worth it. I looked at it again. I may try to retrofit a different rack in there. Possibly opt for something a little more responsive than the stock Audi rack. the german wrote: yeah that is what I was thinking would be the case. From a weight distribution perspective it's not generally worth the effort unless you can get things back 4-6", but if you need the space up front to fit a radiator that 1.5" may be pretty valuable. Yeah, I mean I'd love to stuff it back that far, but that's more work than my desired 3 inches back. But if I can get it the 3" back then it should provide me with the room to mount a sufficient intercooler and radiator. PRY4SNO wrote: Easy solution: 07k. Did a little bit of poking around in the engine compartment. I've determined that the rack itself is not the issue with stuffing the engine back 3 inches. It's the bracket that bolts to the rack that the tie rods bolt to. This picture of a URQ shows what I'm talking about. I've got about 1.5" give or take a little bit before the bell housing will hit that bracket. I think all I need to do is change that up, maybe make a set of tie rods to accommodate that change and then I should be in the clear. 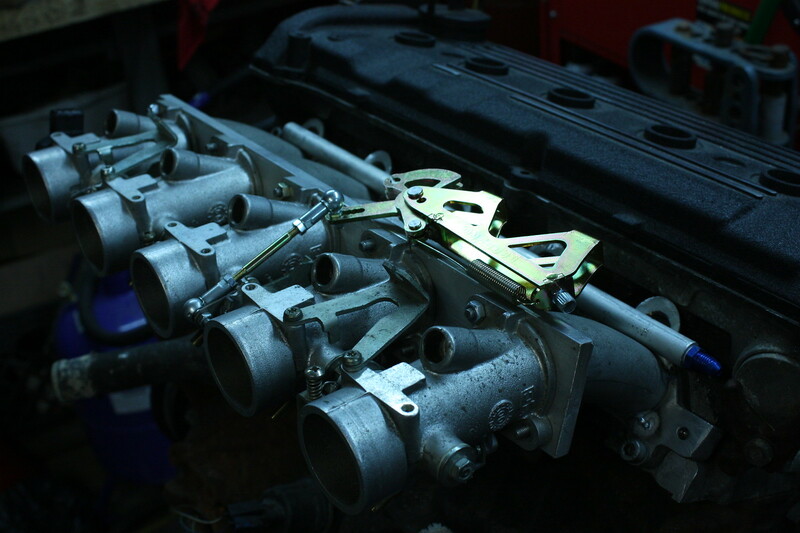 Started working on the throttle linkage. 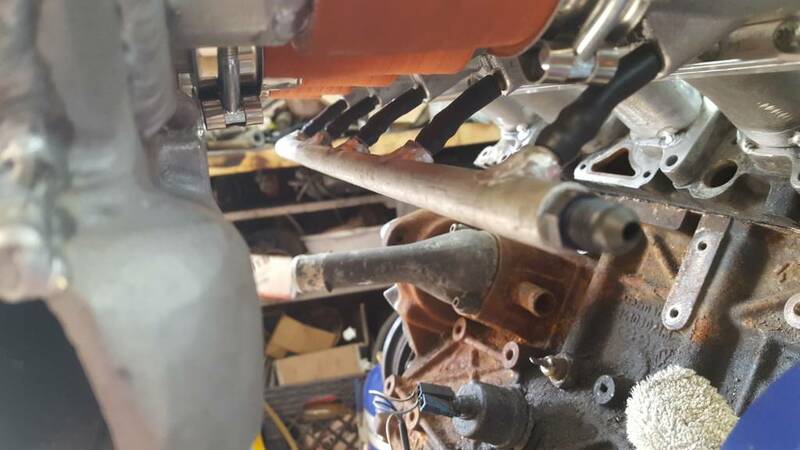 I figured that the linkage from a set of dual Weber DCOE carbs mounted on it's side would be a good place to start. I just need to make the bracket to hold this in place. I can't decide if I want to weld it in place or make the whole bracket removable from the intake. I'll probably make it removable though. 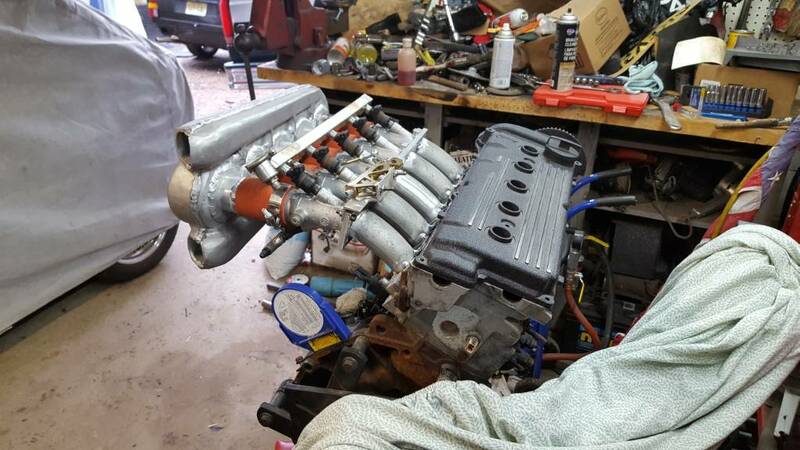 Also, in far more exciting news than the throttle linkage, I got in contact with Jeff for one of his billet cranks so this engine will be receiving a 77.4mm billet crank from Jeff and likely a set of his pistons. Now I just have to get on the horn with Pauter for a set of rods. Bolt-on/removable linkages make the most sense to me. So you're de-stroking the engine? For higher revs, similar to what Chris/dramarider intends? Yes, destroking for higher revs and because for some reason since I got the car I wanted to go the opposite way from most who opt to go to 2.5L and drop it down to 2.0L. But at first I think this thing will only be turning 8300 to 8500 or so rpm.. I know the stock oil pump can flow well enough up to that point. I'm not fully prepared to go with a dry sump oil set up yet, but I figure if I build everything accordingly it will then only be a matter of making the dry sump oil system fit into the car. I've made no significant progress with anything related to the project lately. But I do have some updates. One I decided to forgo the crank from Jeff. The more I think about it the more it's not worth spending the $3300 it costs for one, especially when the factory crank is forged and perfectly strong and up to the task. And two, I picked up an 01E 6 speed last night for the car. I was going to try to keep the locker, but when life dumps a 6 speed in your lap for $200 you just take it and say okay the car is getting a 6 speed! Yeah in the end it is a much better move. 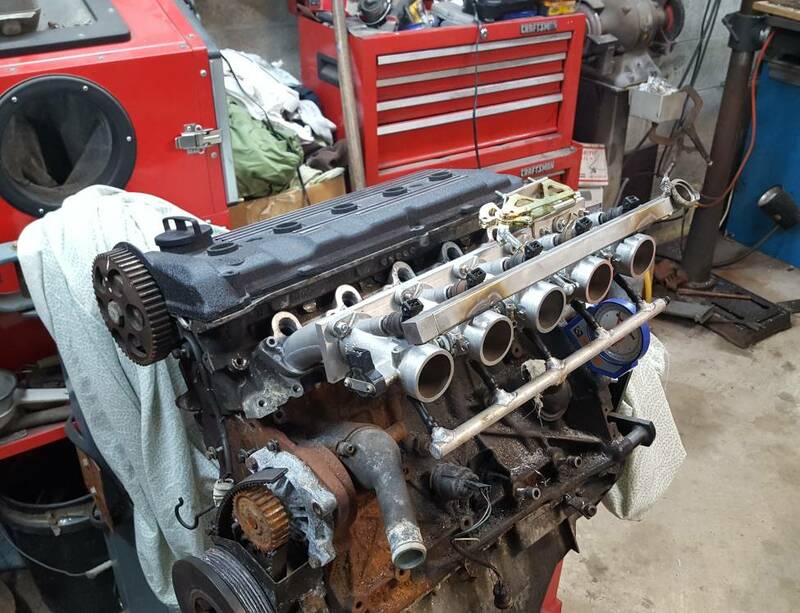 the factory crank is so strong and with the money im not spending on a billet crank i can buy rods pistons and get machine work done to the block as well as get the crank properly balanced. I also made some progress over the weekend. 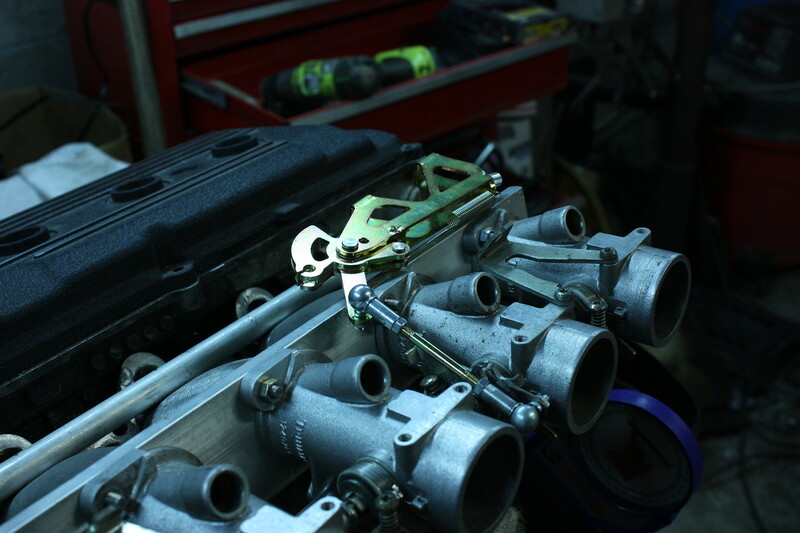 I got the bracket for the throttle linkage made and made a vacuum manifold for the throttle bodies. here's a quick video of the linkage. Looks good! Are you going to make some kind of bracket to support all of that ITB, intake manifold stuff?? It’s hang’n out there! mrdeye wrote: Looks good! Are you going to make some kind of bracket to support all of that ITB, intake manifold stuff?? It’s hang’n out there! Thanks! and yes, absolutely! it is a ton of manifold to be hanging like that once the engine is running and vibrating. I may shorten it up a about 2 inches, but even so I'll still give it some sort of brace. Made a firewall anti-flex bracket over the weekend for the clutch master cylinder as the firewall was flexing so bad it's been noticeably harder to get into gear. I also threw in a new master cylinder last night to accompany the newer slave. Unfortunately I ran out of brake fluid so I couldn't rebleed the system. Hopefully it makes a difference. 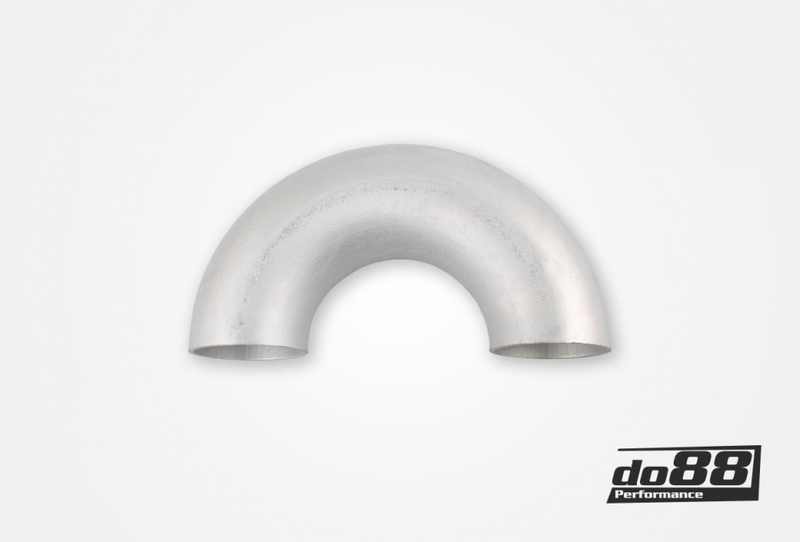 I also ordered some 180 degree bends to make the split tube that goes to the top and bottom of the plenum. 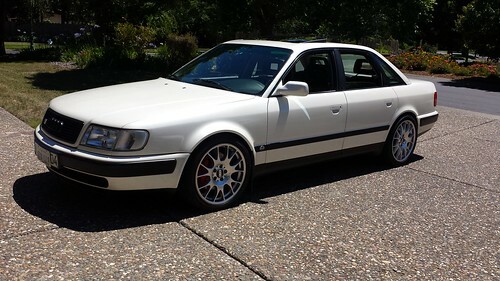 And I started looking into throwing a set of Koni Yellows from a 200 quattro in the rear of the car. While the Mitsubishi Eclipse GSX shocks work fine, they are a little tall for the ride height and I have something like ~1.25" of travel before I'm on the already cut bump stop. My springs are only 300lbs in the rear so while the ride is harsher than stock by a lot, I attribute that more to the lack of shock travel and less to the spring rate. The Koni yellows from a 200 are a solid 2 inches shorter than the Eclipse shocks I have in there now so that's a good increase in shock travel. I may even do the same in the front, but have a set for a Mk1 rabbit revalved to suit the much heavier front end, because I feel even my Bilsteins up front are lacking in travel. No real progress as of late. been super busy, but recently had some time to work on the car/engine. 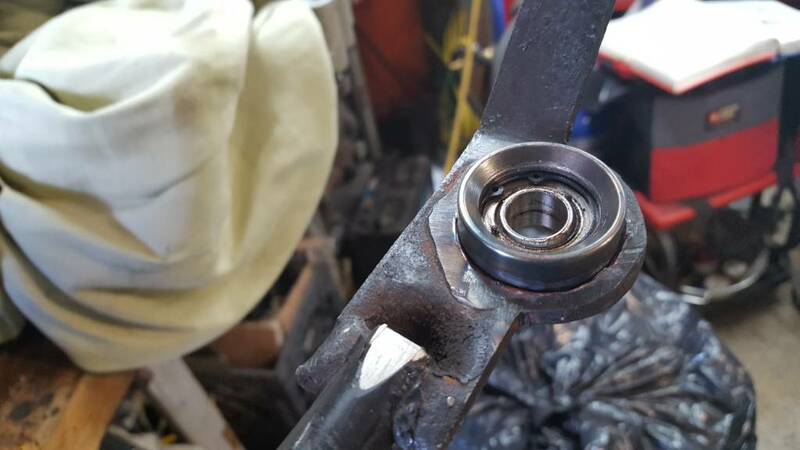 Firstly, the 034 shift bushing took a dump and it was nearly impossible to get the car into gear and has been for a while now. I decided to fix it permanently. 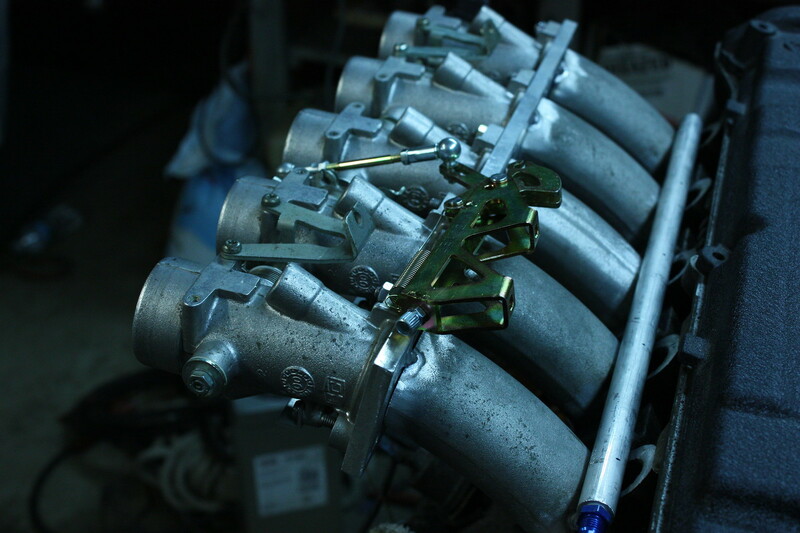 I also worked on the intake manifold or tried to.. I attempted to figure out to to properly measure these bends so I can make accurate cuts so I can tack them together and see how it lines up and then weld it together.. Maybe I've had too many beers.. I'm not sure. How do you plan on attached that shift arm to the transmission now? Man that looks awesome . I think Jim green did something similar but his thread is like 2000 pages long I’m not sure how I’d find it. NM I found it . I like looking through his thread anyways . It’s about 4 pages from the end on my phone. Looks like he did about the same thing you did . I was thinking of doing the same setup myself and I ended up finding the Audi rebuild kit (new ball and cup) so I just went with that for now .